Watch live on NBC10 and Telemundo62 on May 5, 2019! Registration for the Blue Cross Broad Street Run is open for two weeks with 40,000 bibs available. The 10-mile race is set for Sunday, May 5. The iconic Blue Cross Broad Street Run is on May 5, 2019. Registration is open from Feb. 1 to Feb. 16 to be one of the about 40,000 runners in the 10-mile race. The free Health and Wellness Expo will take place on May 3 and May 4 at the Pennsylvania Convention Center. The deadline is here if you plan on registering for a spot in the 2019 Blue Cross Broad Street Run, the 40th edition of the iconic 10-mile dash. This year’s 10-mile run down Broad Street from North Philadelphia to the Navy Yard in South Philadelphia will be held on Sunday, May 5. The free Health and Wellness Expo will take place on May 3 and May 4 at the Pennsylvania Convention Center. NBC10 and Telemundo62 will broadcast the entire race live from start to finish. Runners can register online from Feb. 1 until Feb. 15 at 11:59 p.m. Lottery selections are random and the sign-up period is more than two weeks long, so you'll have an equal chance to be one of the 40,000 or so participants no matter when you sign up, organizers say. It is estimated that 85 to 90 percent of people who enter the lottery will get into the race. This is the 2018 Blue Cross Broad Street Run! Congrats to all the racers who took on Broad Street and conquered it! You don't need to be a marathoner or an elite sprinter to take part in the race. 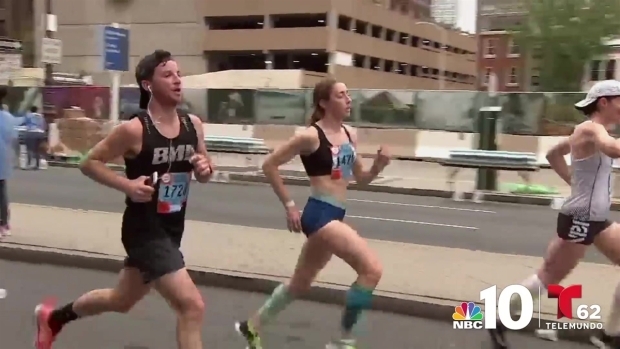 You just have to be able to complete a sub 15-minute mile, organizers say. People can register as individuals or as groups of three to five runners, according to organizers. Runners can find out on Feb. 19 if they have a spot in the field. You will only be charged the $55 registration fee if you get a spot in the race field. People who miss out on the race lotto or want to avoid it all together can also guarantee a spot by raising (or donating yourself) $500 to five select charities picked by race organizers. Anyone who has participated in 10 or more previous Broad Street Runs is guaranteed a spot in the race as a "tenured runner" but they must apply during the regular lottery registration period then alert race organizers if they don't get in on the first turn, organizers said. This year, runners may notice a new race logo and website. They will also get a nifty race-branded tech shirt. The race is one of the largest 10-mile road races in the county. The first Broad Street Run was held in 1980 with 1,500 runners and it has since become one of the city's iconic annual events over its 40 years. “On this milestone anniversary, we are celebrating not only this iconic world-class race, but also the city of Philadelphia itself, which is a huge part of the overall run experience, beginning with the Expo and leading up to actual race day,” Leo Dignan, assistant managing director for the City of Philadelphia Department of Parks and Recreation, said. The race raises money for the American Cancer Society, having raised more than $5 million since 1982. Get more information about registration specifics on the run's website.